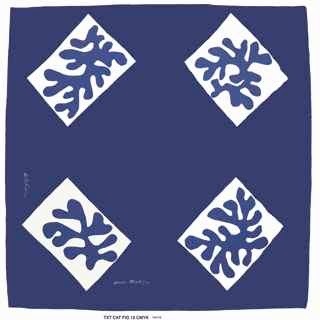 This design by Matisse is currently on view in Artist Textiles: Picasso to Warhol at London's Fashion and Textile Museum through May 17. With designs by many other modern masters including Alexander Calder and Sonia Delaunay, the show looks at how fabrics for fashion and the home made Abstraction and all of the 20th century isms (think Cubism, Fauvism) more accessible. You can get an enhanced glimpse of Matisse's blue square over at Cooper-Hewitt online. But what's especially helpful at CH's revamped collection site is the color coding. For example, below this Matisse there are four related blue samples. Click any one to go down a rabbit hole of color: 1,082 objects with at least a bit of light steel blue; 70 pieces connected to slate blue; 523 lavender-ish items and so on. Everything from 18th-century printed florals to embroidery to ceramics pop up in the mix.